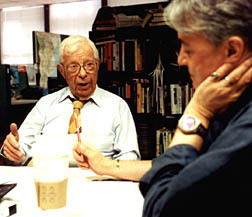 I am tremendously sorry to learn that journalist Daniel Schorr died today. Although many remember him for his ground-breaking reporting from the former Soviet Union, I’ve appreciated his commentary on National Public Radio for the last 25 years. Whenever asked about a particular world situation or personage, Daniel Schorr would invariably broaden the horizon of the question. An event had to be seen within its history and its region; a person’s actions not just individually but in relationship to the ideas and actions of those around him. In his commentary, he traced the path of his own analysis as a journalist, naming factors and influences. When he stated his conclusion, the listeners knew how he arrived at it. Whether we agreed or not, we would have to contend with his facts and his logic. I count him among my most valued teachers in the difficult task of learning to parse complex social issues. Daniel Schorr was a man with a depth of integrity rarely seen even in his generation, much less now. Journalism was a true vocation for him – to seek and provide truth. He followed that vocation even when it caused him to be fired from CBS and later to end his association with CNN. In this, too, he has been a teacher as well as a journalist to many of his listeners. Along with his deep analysis, I will also miss his crisp banter with Scott Simon on Saturday mornings. I hope they play some re-runs tomorrow. I just posted a link to this on Facebook. I shall miss Daniel Schorr so very much. He was a journalistic voice I trusted. As he aged more deeply into his 90s, I knew that someday we’d lose access to his wisdom as applied to future events. Despite the odds, I just kept hoping he’d keep living. I didn’t realize he’d died. Thanks for commenting on his death and linking us to his heritage.